I reviewed the Swiss Navy 2-in-1 His and Hers a few weeks ago and was a little disappointed in the fact that both of its gels felt very much the same. So this week, I am excited to compare the Mild and the Wild of Swiss Navy’s 2-in-1 Just For Her. Like many others, when I see a glycerin-free label on the a product, I trust that information is correct. However, as I was all set to write a review for Swiss Navy Flavored Lubricant in Pina Colada flavor, I happened to glance at the listed ingredients, which do not appear on the Spicy Gear site. 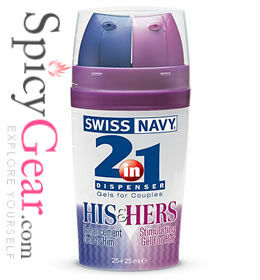 The first thing I love about Swiss Navy’s 2-in-1 lubricating gel double pack is the first thing that you see: the bottle. It looks like a tube of deodorant, but it has two pumps on it– the purple, which is labeled as the Hers, and the blue, which is the His. Seriously, I am obsessed with this bottle. Not only is it super easy to apply, but I want to put all of my lotions and goos into an applicator like this.